This quote from William Gilpin’s treatise Remarks on Forest Scenery and other Woodland Views (1791) introduced a small and delightful exhibition Regarding Trees held at London’s Courtauld Institute, a display of works by masters from the 15th to the 18th centuries and beyond, showing how artists have regarded the tree with the same reverence as a portraitist would a sitter. William Gilpin, the eighteenth century English clergyman, garden theorist and artist, may be best known as one of the originators of the idea of the picturesque- that ‘ruggedness, roughness and irregularity ‘ which ‘men of taste and sensibility in the latter half of the eighteenth century regarded as pleasing’. In 18th century aesthetic of landscape theory, the picturesque is often discussed as distinct but in conjunction with the sublime and the beautiful. For Gilpin, the ‘picturesque’ described any landscape which would remind the viewer of a painting- whether composed by nature, a garden designer or an artist and was situated somewhere between ‘the serenely beautiful and the awe-inspiring sublime’. 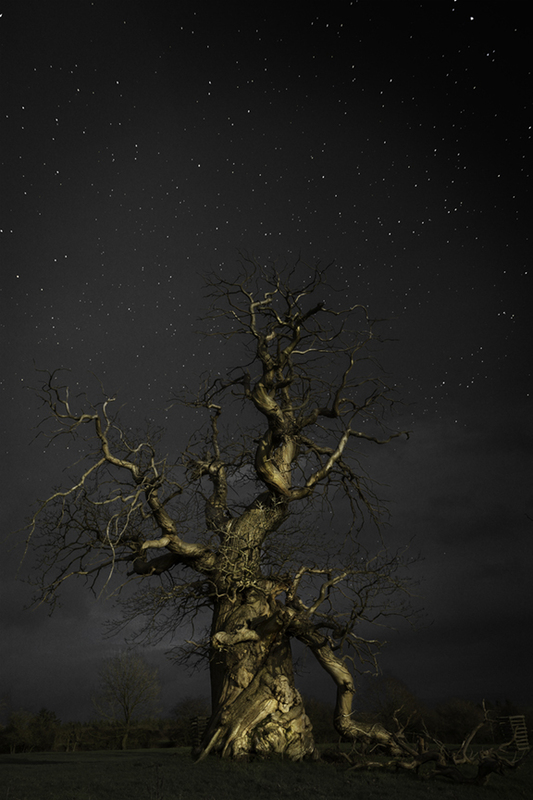 Beauty, Pleasure, Wonder, Awe, Astonishment are all words that describe Beth Moon’s extraordinary new body of work as well as the feelings elicited by her star-lit photographs of some of the most ancient trees on the planet. For the last two decades, Beth Moon’s eye and attention has focussed on trees and particularly individual trees. In 1999, the photographer set out to record the most remarkable trees from different parts of the world, many out of reach of civilisation. Age, notable history and immense size were the criteria to commemorate what she calls ‘earth’s earliest living monuments’. The project resulted in Moon’s book ‘Ancient Trees: Portraits of Time’ (2014) and the photographs were shown in a number of exhibitions around the world. Moon photographed in the early morning light or at sunset when the sun is low in the sky, and at first paid little attention to light after dusk. But more recently, Beth turned her attention to the night sky after learning of two studies that correlated tree growth with celestial activity. In 2014, Beth Moon set out on her night time travels which started in some of the remotest parts of South Africa. After months of careful research and planning and surmounting all the difficulties associated with such terrains, finding the trees under the dome of the Milky Way in some of the darkest skies, left her speechless- Her ‘celestial safari’ has since taken her to Botswana, Namibia, the United States as well as Europe. In England, Beth photographed Croft Castle’s famous Spanish Chestnut avenue, planted between 1580 and 1680 and said to represent the formal battle plan of the ship at the Armada (1588), as well the millennial Bowthorpe oak in the Lincolnshire countryside and the equally ancient Wyndham Oak in Dorset. The edges of time and space appear to collapse in these photographs of Oaks, Baobabs and Quiver trees, Bristlecone Pines, Junipers and Sequoias which have been her models, each individually and painstakingly searched for and lovingly memorialised for us to see. Beth Moon has exhibited widely in the United States, Brazil, Singapore, Italy, France and England amongst other countries, and her work is held in a number of private and public collections, including the Museum of Fine Art Houston, The Museum of Photographic Arts in San Diego and the Fox TalbotMuseum, Wiltshire, England.